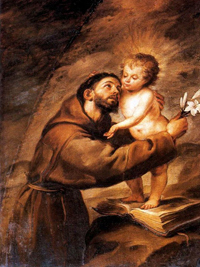 We are fast approaching the Feast of St. Anthony of Padua (who was actually Portuguese and from Lisbon), probably everybody's favorite Franciscan saint after our Holy Father St. Francis of Assisi himself. Whenever we lose an item, we all know whom to ask to help us find it by interceding on our behalf: Anthony. How often might we say that almost jinglelike prayer, "Tony, Tony come around. Something's lost and must be found."? After Mass one Saturday, one of our regular attendees noticed that one of her jade earrings was missing. Several of us searched the pews around the spot she had been occupying, but to no avail. I advised her, "Well you know what you have to do. Ask St. Anthony to help you find your earring." After telling me that it was not particularly valuable but had more sentimental meaning than anything else, she assured me she would seek St. Anthony's Intercession. That evening, as I was locking the gates in front of the Shrine, what did I find lying on one of the metal crossbars of the westernmost gate but the jade earring! How it got there from the inside of the church, I shall never know but I like to think St. Anthony placed it there for me to find. The second example involves a lost Rosary. One of our regular Sunday Mass-goers misplaced her beads in the church. As with the earring, we scoured the area around where she had been sitting but no Rosary was to be found. Prayers for Anthony's help were raised and the following Sunday, she found her Rosary draped over the arm of the statue of the Child Jesus in St. Joseph's arms...put there, I am convinced, by St. Anthony himself. 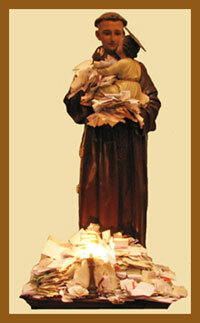 Won't you help us honor this great Franciscan wonder-worker as we prepare for his feast day on June 13? We will celebrate a Novena of Masses beginning on that date...sort of an Octave of St. Anthony (the feast day itself and eight additional days)...and we would love to have your intentions among those on the altar. 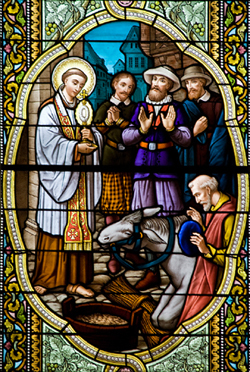 I am hoping that St. Anthony will help us find donors and benefactors to sustain the work and ministry of the Capuchin Franciscan friars here at The National Shrine of St. Francis of Assisi and its Lady Chapel, La Nuova Porziuncola. I am asking you to give as generously and sacrificially as you can because our needs are great. We recently concluded an evaluation to determine what the physical needs of the fabric of the Shrine are and discovered that we must eventually raise in excess of $4.5 million to install an elevator, new restrooms, and kitchen downstairs in St. Anthony Hall, as well as restore the stained-glass windows, murals, organ, floors, pews, in addition to painting the Shrine's interior and providing it with new lighting, electrical, and sound systems. St. Anthony, perfect imitator of Jesus, who received from God the special power of restoring lost things, grant that I may find (name your lost item) which has been lost. At least restore to me peace and tranquility of mind, the loss of which has afflicted me even more than my material loss. To this favor, I ask another of you: that I may always remain in possession of the true good that is God. Let me rather lose all things than lose God, my supreme good. Let me never suffer the loss of my greatest treasure, eternal life with God. Amen.